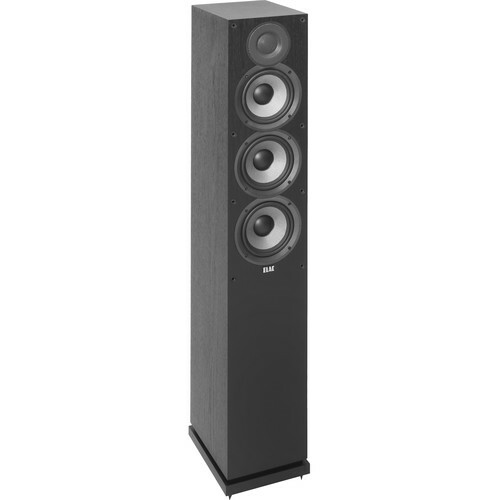 Enjoy dynamic sound from your amplifier with the ELAC Debut 2.0 F5.2 Floorstanding Speaker. It features a three-way design with a 1" cloth dome tweeter, a 5.25" woven aramid-fiber cone mid-woofer, and two 5.25" woven aramid-fiber cone woofers. It accepts up to 140W of power from your amplifier and produces a 42 Hz to 35 kHz frequency response. The cabinet is made from MDF, and the speaker as a whole was designed by Andrew Jones. The tweeter features a wide-roll surround and brings response up to 35 kHz for enhanced high frequencies. The waveguide also helps improve directivity control and eliminate the diffraction modes common to speaker enclosures. The shape of the aramid fiber cone is designed to offer augmented stiffness and damping characteristics over polypropylene or paper cones, helping to achieve a smoother, extended low-frequency response. The woofers and mid-woofer also feature an oversized magnet and a vented pole piece. The cabinets are internally braced for enhanced stiffness and strength, reducing cabinet vibrations that cause unwanted coloration. Box Dimensions (LxWxH) 44.5 x 16.5 x 12.3"